My last two posts were about chai masala and chai, so I thought I’d round it off with a post on Khari biscuits. 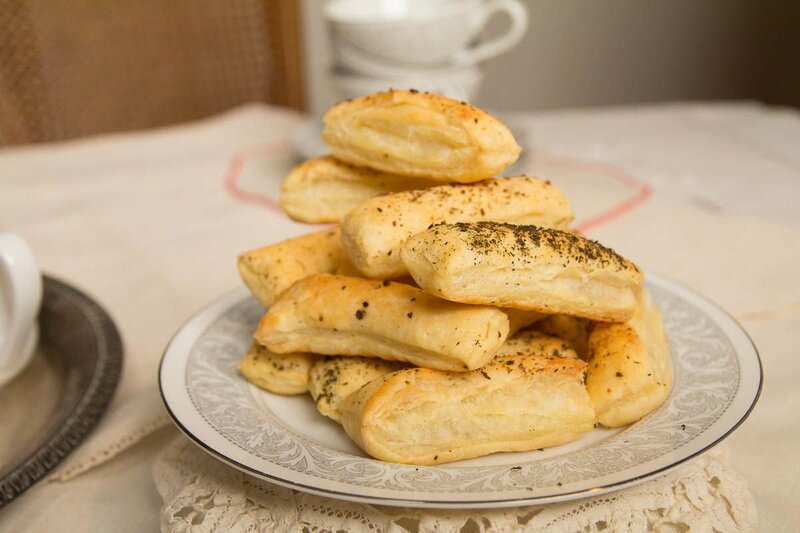 Khari biscuits are simple puff pastry bites. 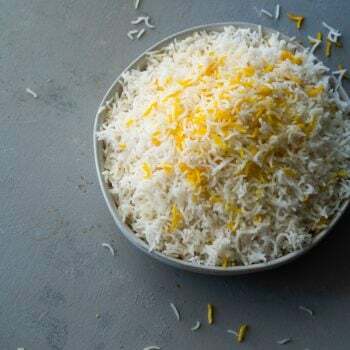 They can also be made the way I like them, sprinkled with spices for extra flavor. 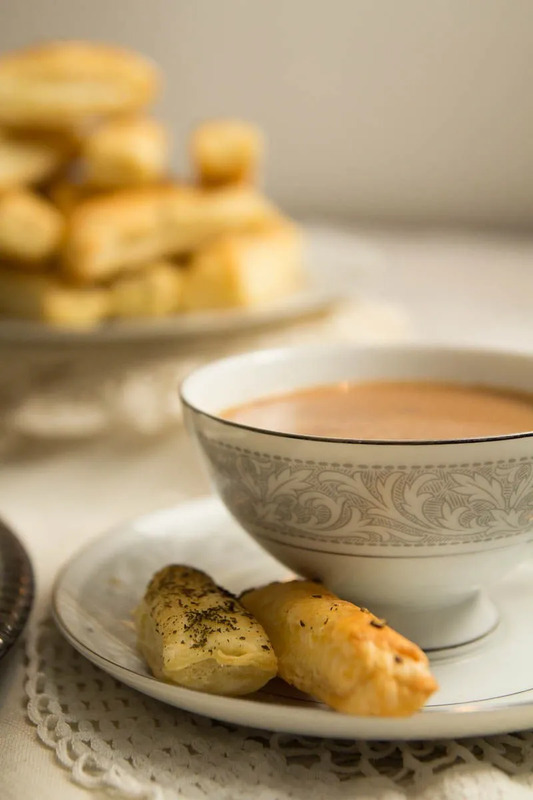 They are perfect dippers for a cup of chai. In India we often have them for breakfast or as a snack. I tried to research the origins of this treat, but it was much more difficult to find out than I had expected. I wasn’t able to find how it got to India but I was fascinated to learn that the credit for inventing puff pastry is claimed by France in the 17th century and Islamic Spain even earlier than that. 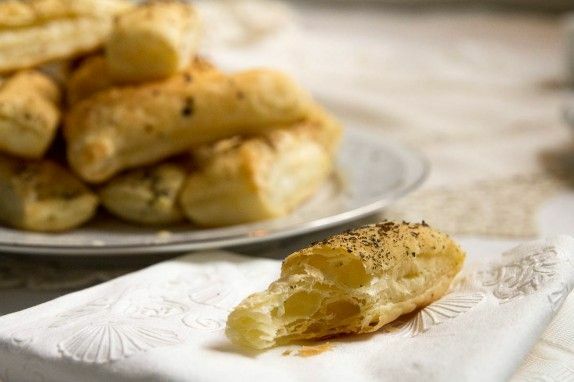 Apparently the Islamic Spanish version dates back to the 13th century where they used olive oil between sheets of dough to make the puff pastry. 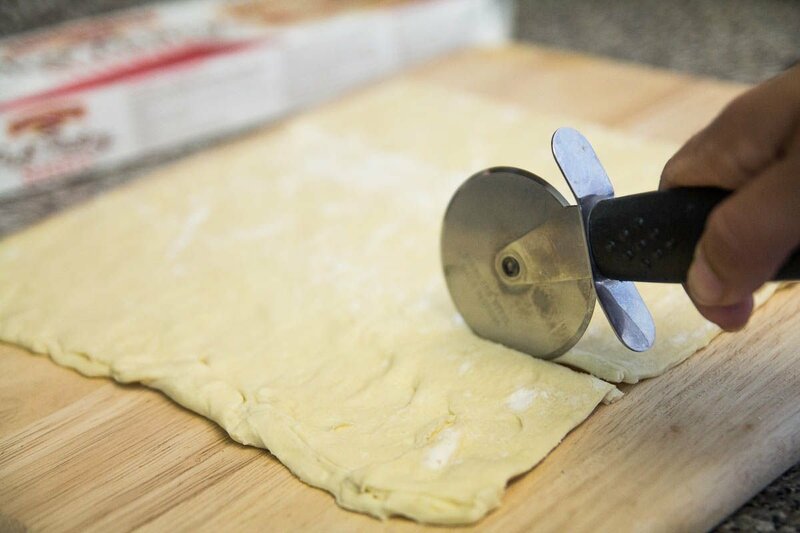 Making puff pastry from scratch is a lot of work, where butter is pressed between sheets of dough, rolled out, folded and repeated many times over. So I took the easy way out and used store bought puff pastry. I just sprinkled it with a few spices and baked it to make a batch of super quick and easy khari biscuit. Also, if you know anything about how and when khari biscuit came to India, please share! 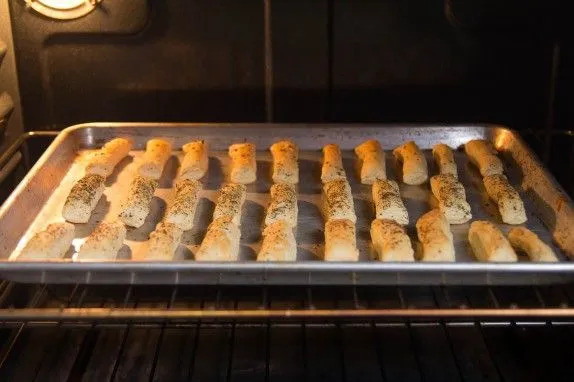 Preheat oven to 400 degrees and lightly oil a cookie sheet. 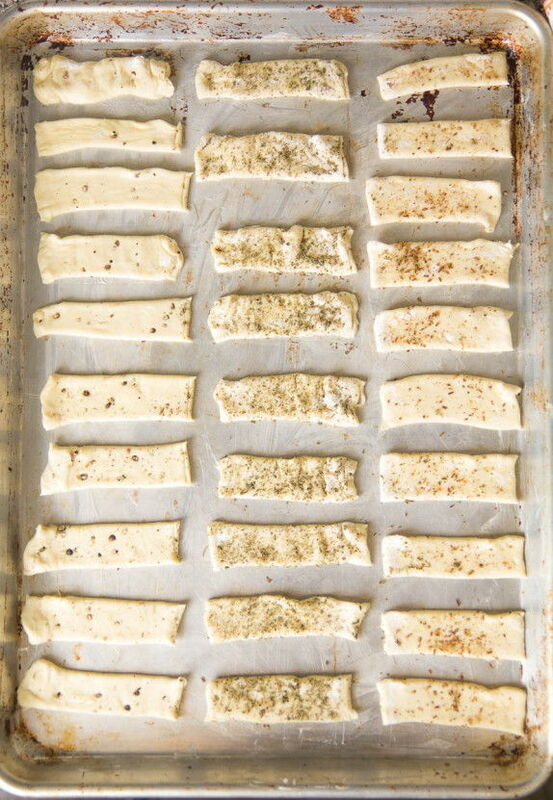 Lay out the puff pastry sheet and sprinkle the spices onto it. 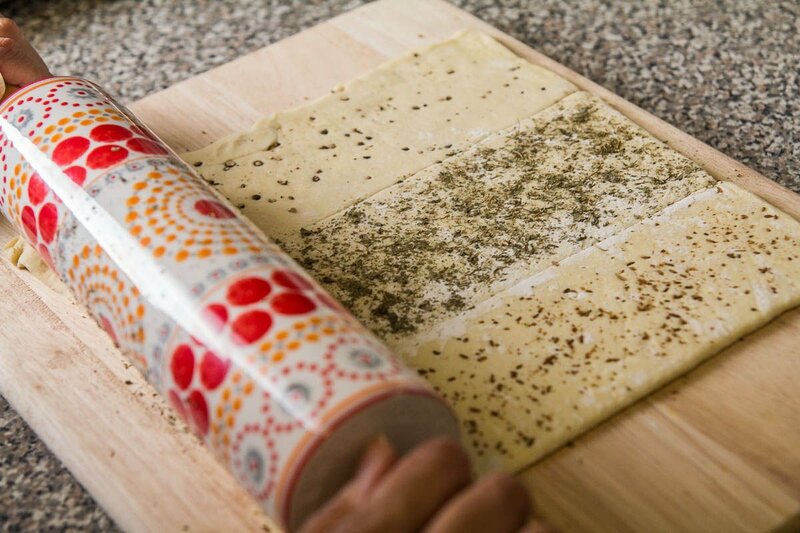 Using a rolling pin, lightly roll over the surface so that the spices get pushed into the dough a little. Skip this step if you are making plain khari biscuit. 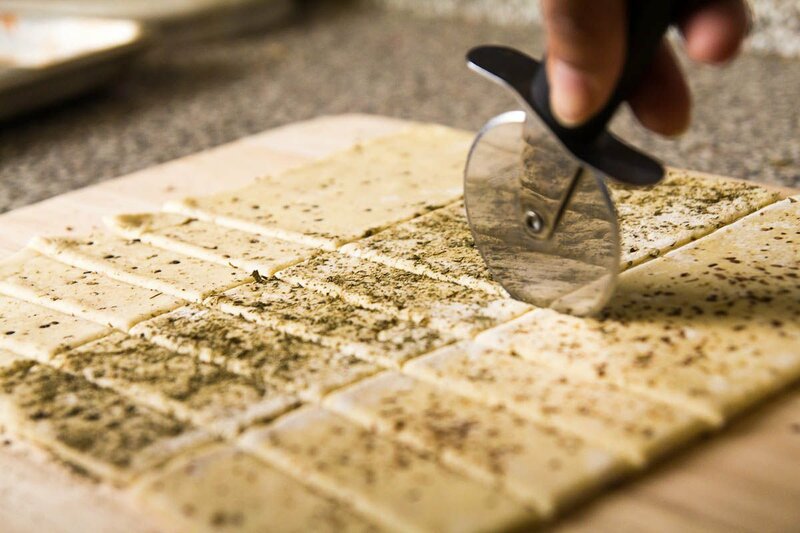 Cut the dough into little rectangles about 2″x 1/2″ or so. I used a pizza cutter for this. Lay out the rectangles onto the lightly oiled cookie sheet. Bake for about 15 minutes. Until golden brown and flaky. 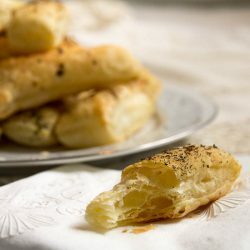 Comments on "Savory Puff Pastry Bites (Khari Biscuit)"
Loved them! I'll try to make these ... it looks so nice! 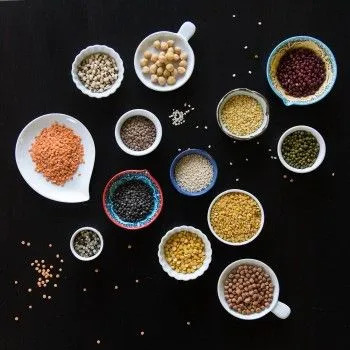 I am new to Indian cooking! Do you have more spice ideas that would work with these? Wow! What a beautiful site you have created. 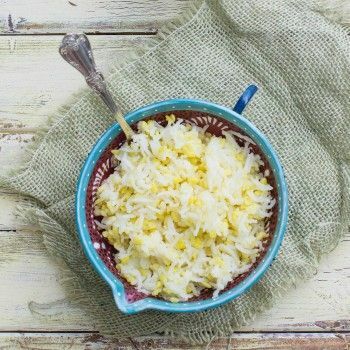 I have been an avid food blog follower for years now and with each story accompanying the recipes you pull thereader in. I shall certainly add you to my list and start with ochre which I adore too. Thank you for such a fun read. I love khari and this is a wonderful way to customize it! Oh and your rolling pin is so pretty!! I am not so sure, but I think it were the Persians who introduced the Khari Biscuit to India. These biscuits today, are found at every bakery possible. It is a very common sight at Irani Cafes in Mumbai, with people visiting after their daily morning walk, and sitting to read the morning daily with a plate full of Khari Biscuits, Bun Maska(Butter) and a hot cup of Chai! Just writing all this has made me drool, and now I know what I am going to have for m brekkie tomorrow! Looks so tempting! But i've gotta make it from scratch, don't think i get the puff pastry dough here!